It’s a fast food outlet! It’s a mini-mart! It’s both?! Wood Green is an unloved part of north London that isn’t exactly a dining destination, so it was the last place I expected to find a fast food-style eatery dishing up bánh mì or Vietnamese sandwiches. 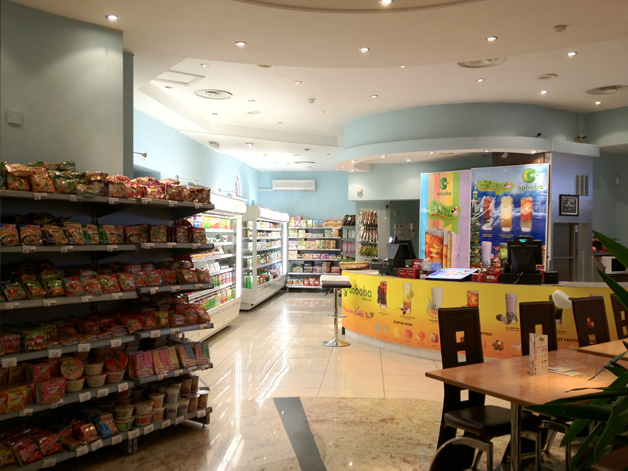 Aobaba is a small three-branch chain, but the Wood Green outlet has a slight twist – it’s also a mini grocer. There’s the usual assortment of Hello Panda biscuits, bottled sauces, instant noodles and derisible pre-packed refrigerated sushi boxes. More exciting, for me at least, is the Chinese and Vietnamese beef jerky and the surprisingly wide array of giò lụa/chả lụa or Vietnamese meat loaf. This is surprising since it’s hard to find – only one supermarket in Chinatown has it and even then only intermittently, while the Vietnamese grocers I’ve been to in Deptford don’t have it at all. 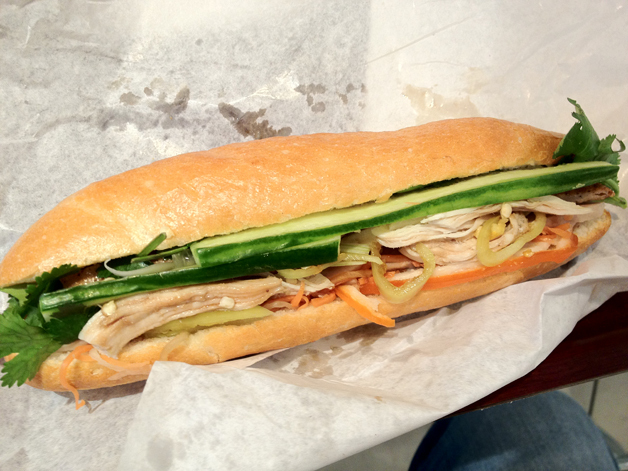 I chose the ‘meat special’ baguette where the pleasingly crisp, sweet baguette is filled with chicken, Vietnamese meat loaf, slow cooked pork, carrots and cucumber along with the unorthodox addition of coleslaw. There was a bit too much carrot, bland chicken and supermarket-standard coleslaw for my liking, but there was enough meat loaf for me to appreciate its sweet, fatty goodness. Don’t get your hopes up for the slow cooked pork though – apart from a sweet, honey-esque coating, it’s entirely unremarkable. The slightly-sweet cucumber is refreshing though, which is just as well as the optional spicy sauce is actually quite hot. Overall, a pretty decent attempt at a bánh mì, but next time I’ll opt for the version filled with just meat loaf. The bánh mì wasn’t quite enough to fill me up, so I paired it with a Chinese-style steamed bao. The soft fluffy exterior was a little saggy and excessively sweet which drowned out the already muted flavours of the pork, ginger, spring onion and quail egg filling. Disappointing. 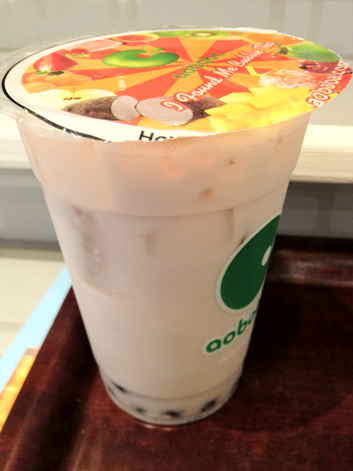 Most of the menu at Aobaba is dedicated to the numerous flavours of bubble tea and other tea-based drinks. Sadly, the flavour of the coconut and taro version was muted at best and the ice cubes outnumbered the black tapioca pearls. Must try harder. Don’t bother prying the top off, just stab it with your straw. 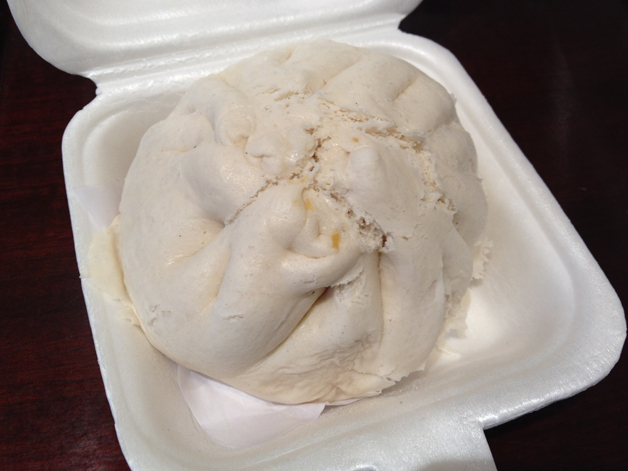 The iffy quality of the bao and bubble tea wasn’t surprising – I was instead surprised by the amateurish service. Although friendly and helpful, two of the attendants at the till argued and fiddled with the till for a good two minutes over how to process my order and I eventually had to pay two separate bills. It’s therefore a good thing I was the only customer at the time of my weekday evening visit. The bao and bubble tea at Aobaba are disappointing, but they have the makings of a good bánh mì – they just need to tone down the filler in favour of the good stuff, and better-quality good stuff while they’re at it. Aobaba is therefore not worth seeking out unless you’re in the area, but it is at least a more interesting fast food option than the usual slop-shovelling chains. Opening Hours: Monday-Saturday 10.00-21.00 and Sunday 11.00-20.00. Total cost for one person including soft drinks: £7-8 approx. Tags: bao, bánh mì, bubble tea, london, restaurant, review, sandwich. Bookmark the permalink. Previous post ← Suda review – posh Thai at budget prices? Don’t come here, this place is a serious ripoff. I went to the Wood Green location and had an original bubble tea, or should I say a “bubble ice”. The drink was gone in four sips, leaving about twenty ice cubes and a dozen tapioca pearls. I paid 3.50 pounds for a few ounces of tea and sugar syrup. I’d have been happier giving the money to the homeless. This is a dishonest business. Who says Wood Green is unloved?